What happens when Barbara Lynch alums bring Italian food to the South End? Bone marrow crostini at Bar Mezzana. If you had 10 grand and a time machine, you could do a lot worse than buying up land in the Ink Block section of the South End. A decade ago, this was a wasteland. Now, dudes in linen blazers and tailored shorts stroll past the latest condo construction projects, and the fanciest Whole Foods in the Whole World has taken up residence in the old Boston Herald headquarters at the top of the hill. The folks behind Bar Mezzana may not have gotten in early enough to make a mint on real estate, but the restaurant seems to be doing just fine. Mobbed on a midsummer Wednesday and swarmed on a Saturday in August, the nifty new coastal Italian eatery has earned plenty of buzz already. Helmed by Barbara Lynch expats Colin and Heather Lynch (the husband-wife team is no relation to Barbara) and Jefferson Macklin, Bar Mezzana arrived among the construction cranes at the beginning of June, anchoring an up-and-coming stretch of Harrison Avenue just west of Interstate 93. Their experience shows: Nearly everything here is in harmony, a clean and vivid concept from the food to the furnishings. Start with one of several elegant, seasonal cocktails (if you’re into that sort of thing) and something from the ever-changing crudo menu, a separate card where about a dozen raw fish preparations show off how comfortable the kitchen is pairing intense, deep flavors. 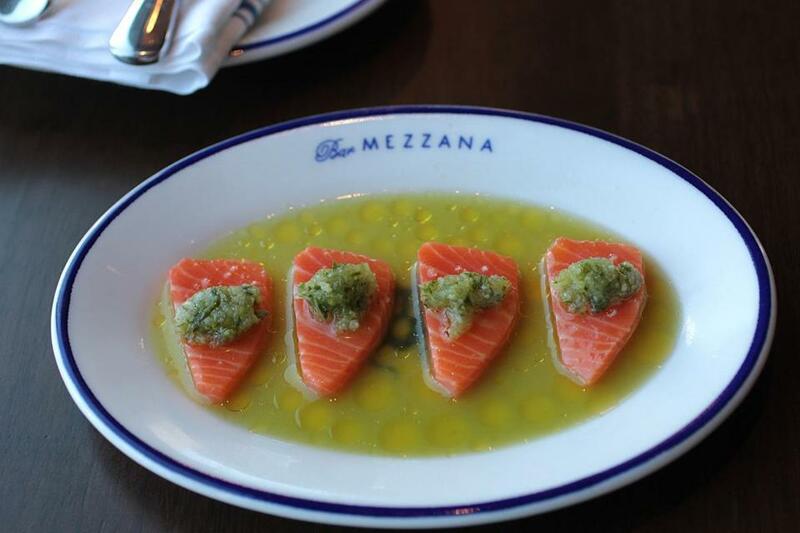 Salmon crudo with salsa verde. The top of the menu features fan favorites — salmon, tuna, and the like. Each is bracingly fresh and tender and swimming in mild sauces, such as a salsa verde with rich, deep orange slices of salmon. A restaurant less confident in the quality of its fish might have sliced the salmon thinner. Here, it’s the width of a pencil. The meatier fish further down the menu can stand up to more potent pairings. Six delicate slices of knifejaw are a match for fresh wasabi; four wedges of shima aji, common in sushi preparations, hold a dollop of caviar each. 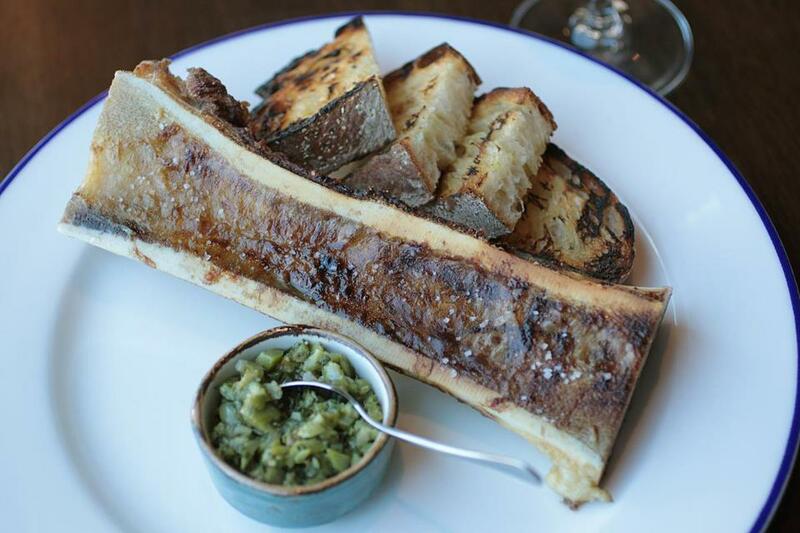 The main menu is further segmented: Plates of prosciutto, alone or with fruit or mozzarella, are enough for at least four diners; a section of crostini follows, featuring a rich, delicious marrow bone nearly as big as a human shin. It might be enough fat to turn a diet cheat day into a cheat week. On the antipasti menu, an artichoke salad includes a heap of shaved hearts and halved olives swimming in a citrusy dressing that manages to be bright without being overly acidic. 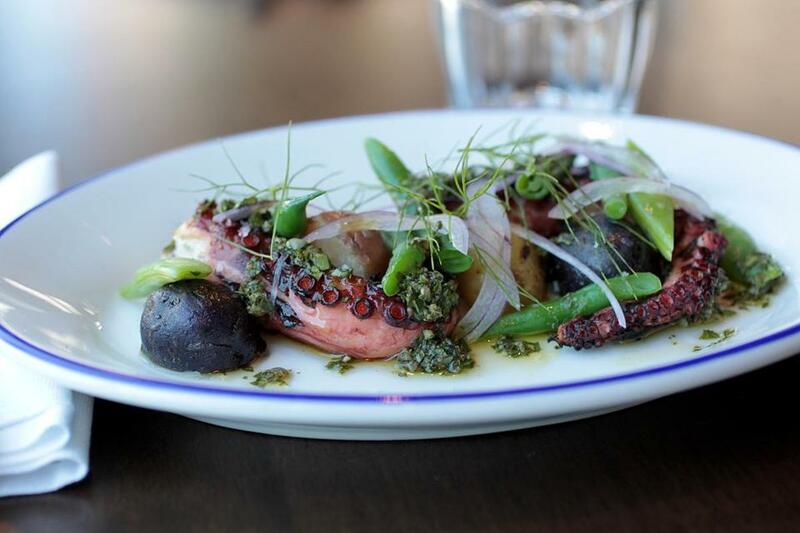 A meaty tentacle of grilled octopus features a nice char on the outside and tender flesh; a fresh salsa complements it without obscuring any of its flavor. As is often the case, main dishes — both on the “primi” pasta menu and the small “secondi” section — pale slightly in comparison to the in-your-face flavors of what came before. Most are still satisfying, if not quite as inspiring as the earlier courses: House-made pastas have the right amount of chew and seem to have spent just enough time boiling. 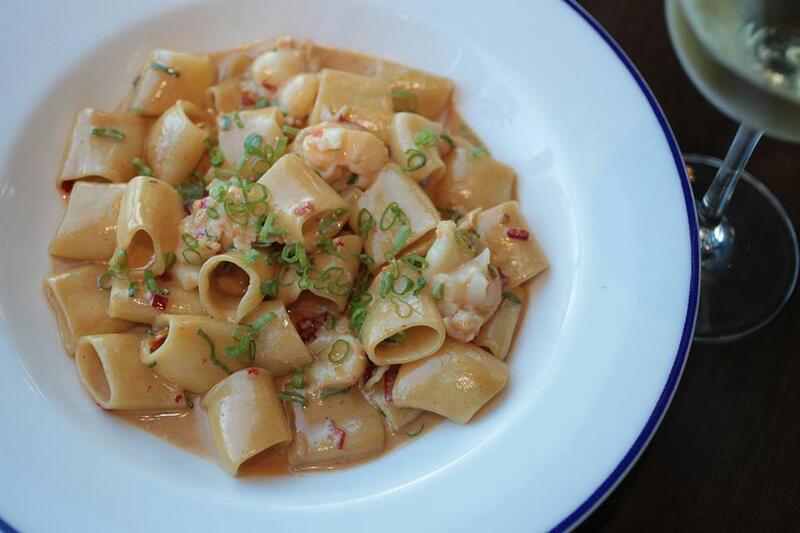 Duck ragout with garganelli is meaty and rich; lobster paccheri is like a great bisque expanded into an Alfredo — sadly, this isn’t the kind of place where you can lick the bowl. Some spaghetti dishes suffer from a uniformity of texture and color that can turn even small portions boring. A crab and sea urchin dish incorporates nearly all of its fish flavor into its sauce when a morsel or two of shellfish would carry the day. Shaved tuna heart involves an interesting technique — curing tuna and grating it like truffle or bottarga over spaghetti in a faintly spicy sauce — but the result looks and tastes a bit like katsuobushi. Common in Japanese cooking, the fish flakes are often sold here as cat treats. Fish dishes are expertly cooked, though suffer a bit by comparison. After you’re blown away by the intense flavors of the first courses, a subtly seasoned hunk of striped bass seems a tad boring. Rib eye for two, on the other hand, resurrects that marrow bone and pairs it with a 24-or-so-ounce bone-in rib eye, sliced and served with fingerlings and a vinegary herb paste. What do you do with the marrow? Whatever you want, really: smear it on the potatoes or right on the beef — an umami festival that stands up to the bright flavors of the first and second courses. Under beverage director Ryan Lotz, cocktails at Bar Mezzana are a delight — seasonal and smart and mirroring the menu’s emphasis and deep, true flavors. The Sophia, a spritz based on lightly carbonated Lambrusco, would pair beautifully with even beefier dishes; The Duchy of Milan, described on the unusually helpful cocktail menu as “martini-esque,” might send you scurrying across the parking lot to Whole Foods in search of a bottle of gin. The playful wine list — sections include “pink wine!” and “not quite merlot” — is naturally Italian heavy, with plenty of refreshing whites and other options to pair with fish (and 90 degree days). The beer list is carefully curated as well, and on a recent Saturday included fresh, bright pale ale from Fort Point hot spot Trillium Brewing. Service is friendly but can be slow: Visits more than a week apart stretched to three hours long. The first one might’ve been my fault — a big order on a busy night. But the second was inexplicable, and if the food hadn’t been so fulfilling, the wait between courses would have felt very long indeed. By the time the dessert menu shows up, you might be about ready to hail the valet. That would be kind of a shame, because gelato and sorbet — a shifting list of a half-dozen inventive flavors — are excellent and reasonably priced. And coffee service, while it’s a small thing, is well executed and reasonably priced. An affogato for $5 pairs the best of both. 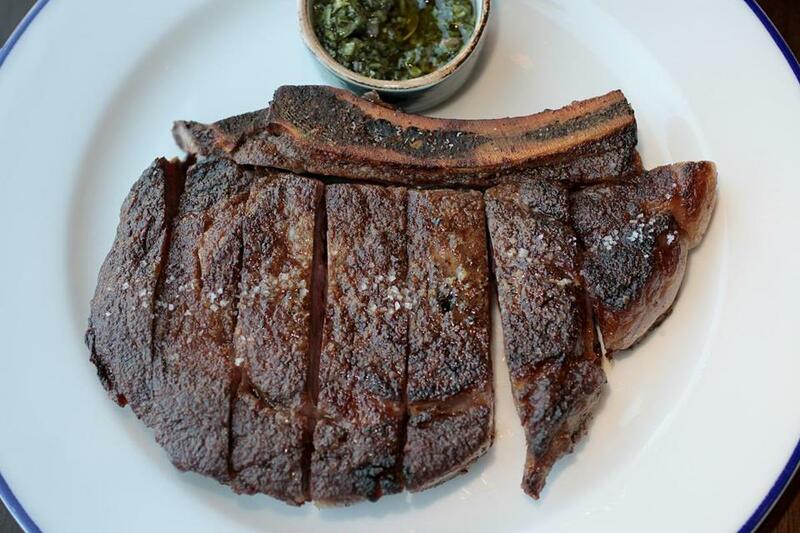 Sliced rib eye for two with marrow bone. The long waits between courses are confounding, both because the bottom line is better served by turning over tables, and because Bar Mezzana is not really a three-hour-culinary-tour-of-the-Italian-coast kind of place, and to its credit does not aspire to be. Rather, it’s a walk-in-after-work place, or a Saturday-night-hey-where-should-we-go place. It is direct and not exorbitantly expensive — the kind of middle-way restaurant that is increasingly hard to find in many American cities. It is, in the best possible sense of the word, comfortable. As the neighborhood develops and grows, Bar Mezzana might be less a destination and more a neighborhood gem — always full but never slammed, the kind of place where dinner at the bar is pleasant, a 20-minute wait for a table is typical, and a reservation two weeks ago is overkill. The splash of purple and orange sunset out the west-facing window may not coat the dining room each evening forever — the new condos will see to that. But Bar Mezzana should be here for a long time. 360 Harrison Ave., South End, Boston, 617-530-1770, www.barmezzana.com All major credit cards accepted. Wheelchair accessible. Prices Crudo $12-$25, appetizers $7-$20, main dishes $17-$33, desserts $3-$11. Hours Mon-Wed 5-10 p.m., Thu-Sat 5-11 p.m., Sun 10:30 a.m.-2 p.m. and 5-10 p.m; bar Mon-Sat 4:30 p.m.-1 a.m., Sun 10:30-1 a.m.